2 What is the C toolset? B.1 What if the program will not run? This document presents a cook book approach to writing parallel C programs for single and networks of transputers. Using the IMS Dx214 series C toolset the user can write programs which contain many parallel processes, these processes can then be mapped onto a number of transputers using a method called configuration. Although this technical note is aimed primarily at new users to the INMOS development systems, advanced users may find this useful to come quickly up to speed with the new IMS Dx214 C toolset. Also, users of the IMS D711 3L/INMOS toolset may find this note of interest as there is a section on how to convert existing IMS D711 C code over to the IMS Dx214 toolset. IMS D7214 C toolset for IBM-PC. IMS B008 Motherboard for IBM-PC. IMS B404 TRAM (Two were required for the network example). The IMS Dx214 is a software cross development system for transputers, hosted on a variety of platforms e.g. PC, SUN3, SUN4 or VAX. The development system consists of a set of tools to enable users to write programs for single or multiple transputer networks. In this section we shall look at the typical development cycle for code running on single or multiple transputers. A brief outline of each tool used at each stage is given. Later on in the document we shall show, by means of worked examples, exactly how to use the tools at each step. For now this serves as a guide to where the tools fit into the grand scheme of things! The following is a brief list of all the tools provided in the toolset. icc The ANSI C compiler. icvlink The TCOFF file convertor. idump The memory dumper. Used by idebug. iemit The transputer memory configuration tool. ieprom The EPROM program formatter tool. iserver The host file server. isim The IMS T425 simulator. iskip The skip loader tool. This section will take a look at the major tools and steps involved in developing software for a single transputer system. The Edit phase consists of writing the source code for your program, this will include all of the source modules and header files. Any standard text editor can be used for the C toolset, e.g. MicroEmacs, Microsoft Word and even edlin. The compilation phase consists of submitting the source code to the compiler. The compiler is called icc, which stands for Inmos C Compiler. It requires the name of the source file and which processor type you wish to compile to. Linking is achieved using the ilink tool. This pulls together all of the object files and any libraries that have been created. When compiling for a single transputer then the whole of the C Run Time library is used to give access to the host services. To make the program run a transputer, a Bootstrap must be added. This is a small piece of code which is added to the front of your code and contains instructions to reset the transputer and get ready to load and run your program. After the load has occurred the bootstrap is overlayed and disappears. To add this boot strap we use the icollect tool. To load the program onto the transputer we use the iserver program. This program sits on the host and enables the transputer to access the hosts services, these include the file system, keyboard and screen. If the program failed to run correctly then we enter the debugging phase of development. The toolset provides an interactive single stepping debugger called idebug. The user can specify breakpoints and trace through the code. This development cycle is almost the same as for the single transputer systems, the exception is in the use of the configuration tool icconf. 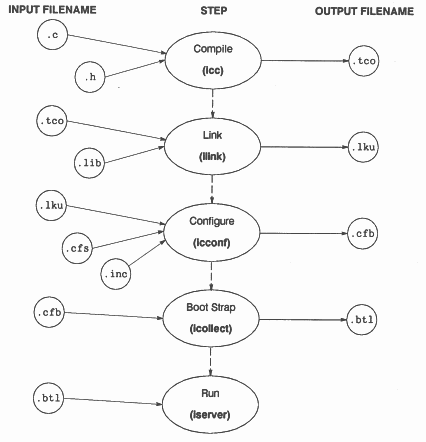 Configuration is the step taken to map processes onto processors. The step consists of writing a configuration script which states how this mapping is to occur, we shall take a look at some example scripts later on. 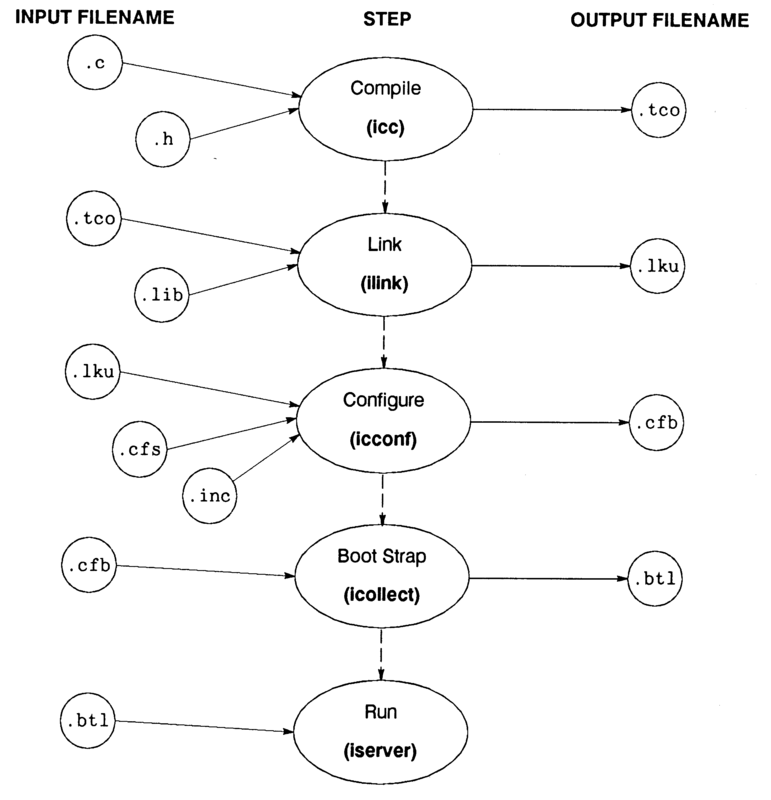 The tool for this step is called icconf. There are two parallel components, Master and Worker, these are called processes. 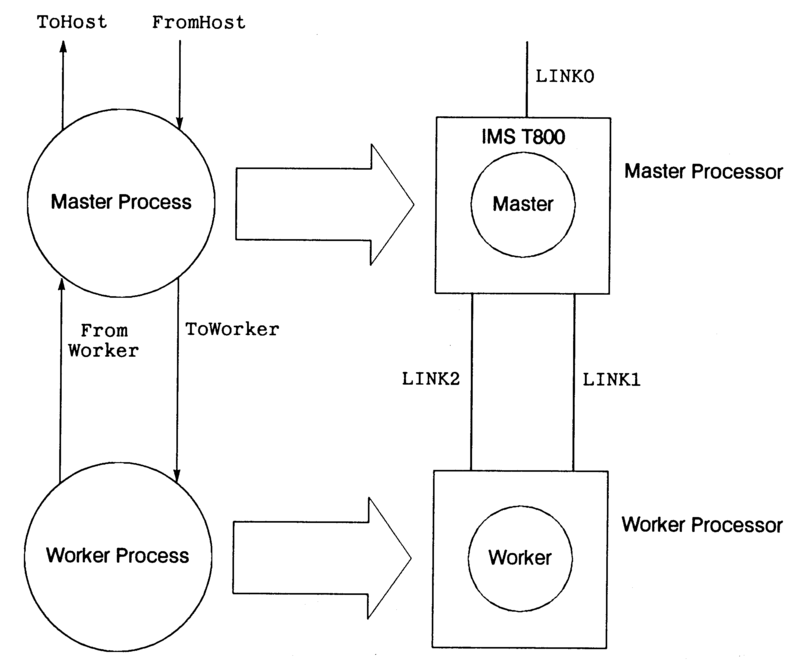 They communicate with each other using channels, these are shown on the diagram as ToWorker and FromWorker.To access the host services, i.e. screen and keyboard, we use the FromHost and ToHost channels. The two processes are written in C (we could have easily chosen another language e.g. Pascal, Fortran or Ada). 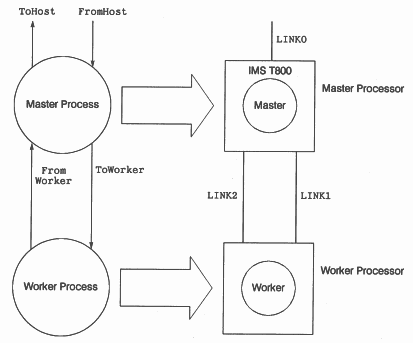 The Master process takes input from the keyboard via stdin and passes it onto the Worker via the ToWorker channel. The Worker processes the data and passes it back to Master via the FromWorker channel. The Worker simply takes the keyboard characters and turns them into upper case characters, these are then displayed by the Master process. 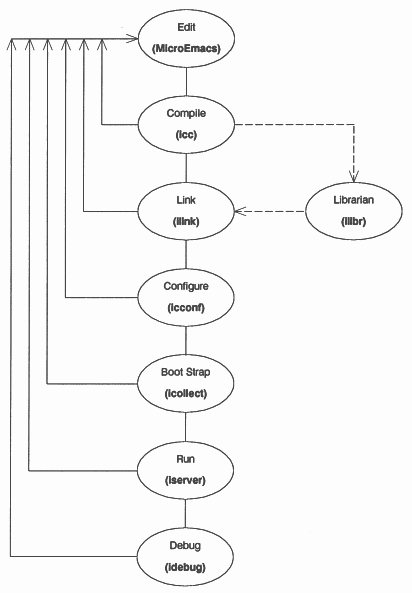 Configuration is the process by which individual components of the system are mapped onto physical processors. For the simple upper casing example we have two parallel communicating processes. This can be run as two parallel processes on one processor or as two processes running on two separate processors. Figure 4 shows how the two processes are mapped onto two separate processors. Each transputer has four links, for this simple example we shall only use two links for communication, these are marked on the diagram as LINK1 and LINK2. The LINK0 is connected to the host machine, this is the link by which the system is booted and all communication with the host is passed back through this channel. For our example, all of the keys and output messages are passed via LINK0. Each INMOS link is bi-directional, this means that you can map one input channel and one output channel onto one physical link. In this chapter we shall use the IMS Dx214 C toolset to build and configure the upper case example. Upper casing on a single transputer, all in C.
Upper casing on two transputers using the icconf configuration tool. As well as being an ANSI standard C compiler, icc provides a rich set of parallel processing library calls to enable us to write parallel programs all in C, for more in depth coverage of these routines the reader is referred to . The extensions are similar to the ones provided in the IMS D711 INMOS/3L Parallel C compiler . -- MODULE: Upper Casing Example All in C, using icc. -- The Master and worker processes are in different files. -- Allocate and initialise some channels. -- Allocate the processes needed. -- This will not return until ALL of the processes have finished. -- All processes have successfully terminated, lets say so.. The process is defined as a function call i.e. The Process * parameter must always be supplied, it is needed so that the process can be executed by the system. To create the process we must use the ProcAlloc function i.e. 0 - Default workspace size (4Kbyte on a 32-bit transputer and 1 Kbyte on a 16-bit transputer). 2 - Number of parameters to be passed, in this case its two. ToWorker - First parameter, in this case a channel called ToWorker. FromWorker - Second parameter, in this case a channel called FromWorker. Note that WorkerPtr is the pointer to our process (or NULL if no space), ProcAlloc( Worker, 0, 2, ToWorker, FromWorker ) is the function that builds processes. Now that we have set up the processes we must run them in parallel. To achieve this we use the ProcPar library call i.e. MasterPtr - The master process. WorkerPtr - The worker process. NULL - No More processes. This also initialises the channel. -- MODULE: Simple Parallel C example. -- pass them to the upper case worker process. This is the master procedure. A character is read in and passed along a channel to the worker process. Channel communication is done using the ChanOutInt and ChanInInt library calls. -- convert them to upper case, whether they want to be or not!! -- Declare the worker process. Again, channel communication is done using the ChanOutInt and ChanInInt library routines. 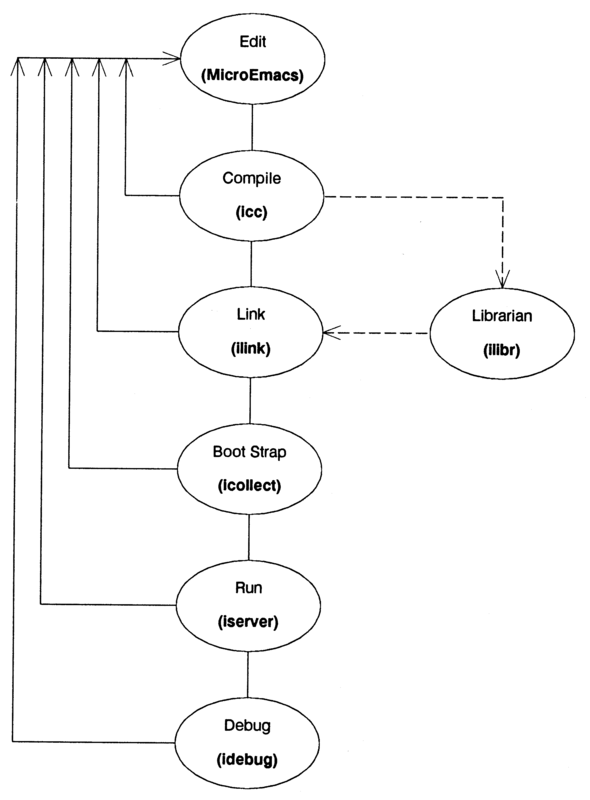 This will invoke the C compiler (icc) and the linker (ilink), the output of the linker is then used to produce a bootable file which can be downloaded to the transputer. iserver - Invoke the host server program. /se/sb system.btl - Boot the file system.btl to the transputer and monitor the error flag. Booting Root Transputer - Message from the server as it starts. Now that we have the two process version working we shall map this onto two transputers using the configurer. The IMS Dx214 Toolset provides a C like configuration language to specify how the mapping is to occur. The configurer tool is called icconf, which stands for Inmos C Configurer. The physical system was shown earlier in figure 3. The reader should refer to this diagram as it will make this section clearer. As before, intimate details of the configuration language syntax is ignored, the interested reader is referred to the IMS Dx214 ANSI C toolset User Manual . The icconf tool takes, as input, a textual description of the transputer network, with a file suffix of .cfs, and outputs a configuration data file, with a .cfb suffix. 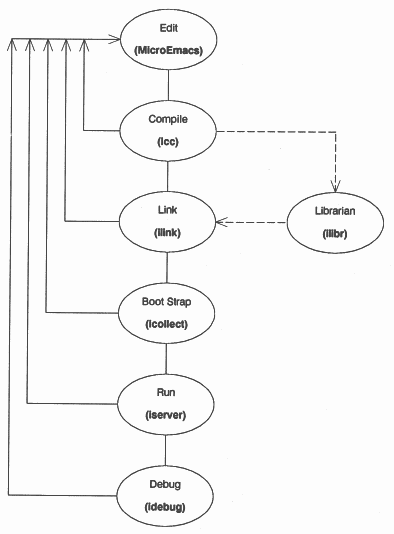 This file is then passed into a code collector tool called icollect. The output from this tool is our bootable file that we can run on our network of transputers, using the iserver. The .inc files are predefined descriptions of transputer modules (TRAMS). -- Access the external configuration channels. Notice the use of the get_param function to connect to the external configuration channels. It is worth mentioning that the configuration channels zero and one are reserved for by the C run-time library. Now we are in a position to look at the configuration script required to build the example on two processors. -- 2 x T800 TRAMSs in ours. -- Pull in the "real code"
T800 - Type of processor. memory = 2M - Describe amount of memory available on this processor. Root - Name of the transputer node. We must describe how the links of our root and slave processors are connected. 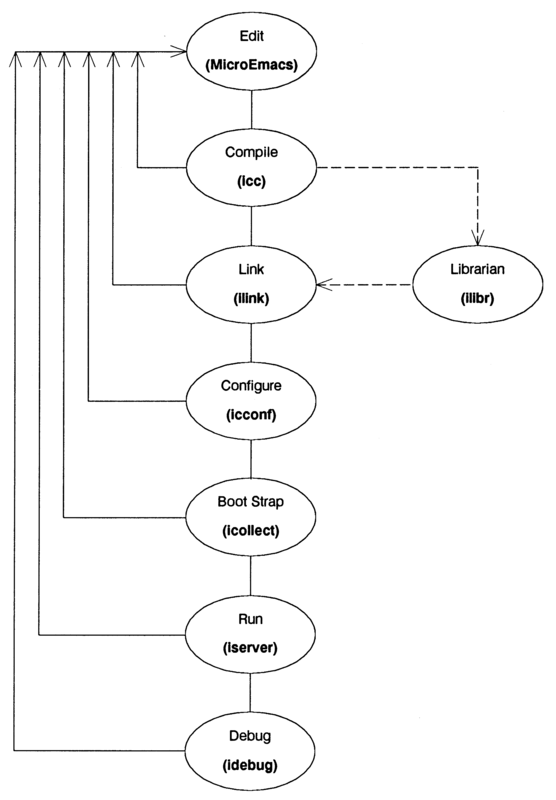 The root node is connected by its Link 0 to the host computer. connect Root.link, host - Sign up for the host services. connect Root.link, Slave.link - Connect root node to Slave node. This section describes how our process is joined to all others in the system.We pass in channel parameters and data concerning the size of the stack and heap required. stacksize = 1k - Size of the stackspace. heapsize = 50k - Size of the heap. interface - Configuration keyword. Here comes the interface description. input fs - Pass input channel called fs. (Channel parameter 1). output ts - Pass input channel called ts. (Channel parameter 2). input FromWorker - Pass input channel called FromWorker. (Channel parameter 3). output ToWorker - Pass output channel called ToWorker. (Channel parameter 4). Master - Name of this process. This interface section is how channel parameters are passed into the C processes (although the parameters do not have to be channels). The textual declaration of the channels determines which number should be used in the get_param call. WARNING! There is no checking that the parameter number is wired to the correct channel. The next section wires up the soft channels to the processes on the transputer nodes. connect Master.fs, from host - Connect to the server on the host. connect Master.ToWorker, Worker.FromMaster - Connect the Master to the Worker. To pull in the actual compiled and linked code we use the use directive. use "master.lku" for Master - Pull in the master process. use "worker.lku" for Worker - Pull in the worker process. The final stage is to place all of our processors onto a transputer node and place the soft channels onto physical transputer links. place Master on Root - Run Master on the first transputer. place Worker on Slave - Run Worker on the second transputer. place Master.fs on Root.link - Connect up the server channels. place Master.ToWorker on Root.link - Connect up the Master using channel 2.
place Worker.ToMaster on Slave.link - Connect up the Worker using channel 1.
icconf - Invoke the configurer. upc.cfs - The name of the configuration script. This is done exactly as described previously. This document has taken at look at the various methods for writing parallel C programs. The user has the choice between a program written and configured completely in C or using a Mixed language approach by wrapping the C programs in occam. All of the methods allow the user to initially test the system on a single transputer, once this is working then a configuration script is written and the system is parcelled out onto multiple transputers. Table 2 provides a comparison between the, IMS D711 and IMS Dx214 concurrency libraries. If you are recompiling code from IMS D711 with the IMS Dx214 C toolset you should include the conndx11.h file. This contains macros to convert the IMS D711 channel and thread calls to equivalent IMS Dx214 calls. Here are a few simple rules that you may find useful when writing parallel programs using the IMS Dx214 C toolset. Writing parallel programs can be a confusing task! Good program design is essential when writing software that may execute on tens or even hundreds of separate processors. Further details on writing concurrent software are available in . This code segment makes use of a conditional compilation flag called CONFIG, when this is set it will turn the process into one which can be configured. If the flag is not set then the process is assumed to be running on one processor. Make sure that any external transputers, such as in an INMOS ITEM rack, have power! Use the checkout tools to see if your transputer network is what you thought it was! If the program requires setting of any IMS C004s, has this been done? Compile with the debugging option (/g) on and use the debugger! Run the iserver with the /se option on to test if the error flag has been set. Ensure that all ProcPar calls are NULL terminated. Ensure that all ProcAlt calls are NULL terminated. When you specify that there are n parameters passed to a process make sure all n parameters are passed. Make sure you have used exit_terminate for configured programs. The server will not terminate until this has been executed! Make sure you have allocated some space for a channel. Check that the get_params are connected to the correct channels in the configuration script. Check that the transputers, in the network, have enough memory. Do not specify 1 MByte in the configuration script when only 32K is available on the TRAM. Does the processor type in the network match what you have compiled for? Make sure that there is enough stack and heap space.